Enjoy bicycle-type exercise from your chair or place the unit on a table to exercise arms. Helps improve circulation and muscle strength. 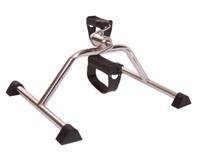 Made of heavy-duty steel with large knob to adjust for variable resistance. Features comfortable pedal straps to help hold feet in place while in use. 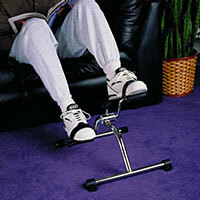 Exerciser for cardiovascular fitness. Pedaling increases circulation without jarring joints. May be used for both upper and lower body. Comes fully assembled. Rubber pedals and straps.